Bringing your pet along for the ride is all fun and games until your car, becomes a mess. While I’ve gone over how to ensure your precious cargo is safe when riding in your vehicle, today I’m here to give you some helpful tips on how to keep your car clean with those beloved animals of yours! When your pet is accompanying you, try and keep them in one area of the car. This will confine all of the pet hair and help keep it from spreading. Whether you use a crate, restraint, or confine them to the passenger seat, keep your pet in one area to keep the potential mess at bay. Cover up your seats! You can invest in a seat cover or simply lay towels down, but protect the interior of your car from your pet’s elements by covering it up as you are able. This way, you can just toss your covers in the wash and ta-da! Your car is now clean. This is also a very easy way to minimize the pet odor in your vehicle. Don’t leave the mess around. 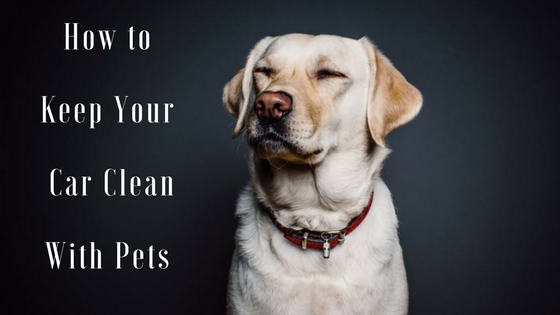 Once you’ve arrived at your destination or returned home, get right to work at cleaning up whatever mess your pet might have made. Don’t let your car fester in the sun with your pet’s lingering odor. Simply wipe down the seats or quickly vacuum out your car. You could even use a lint roller–a little goes a long way! Trust me, this will make your life easier. If you drive with your pet often, you might become immune to their smell. Avoid this permanent odor by taking care of it right away! There are many ways to combat this. If you haven’t cleaned your interior in a while, get any mats and seat covers washed. To keep a fresh scent in your car, try sprinkling baking soda on the floors or placing dryer sheets under your seats! Do you have any handy-dandy tips for cleaning up after your pet in your vehicle? I’d love to add them to my list! Let me know about them in the comment section below. Check your blind spots! Motorcycles are obviously smaller than other vehicles on the road, and can easily blend into your blind spots–so be cautious! Especially when passing and changing lanes, remember to check your blind spots thoroughly before you do so. Use your signals. While this is an action you should always practice, this is important especially around motorcycles. When passing a motorcycle, the gust of wind that your vehicle creates can cause the motorcycle to become unstable and potentially knock the rider off the road. So, especially when passing motorcycles, use your turn signals! Let those around you know your intentions so they can anticipate your vehicle’s motion. Be extra cautious at night. Help the riders on the road stay safe at night by increasing your following distance. Be sensitive with your brights. 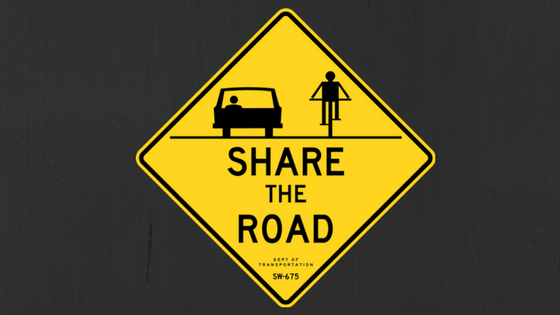 Share the road! Your vehicle is not the only one on the road, so be courteous to all of those around you. Whether you’re a fan of motorcycles or not, there is a person riding on them, so drive safely and defensively around them. You find yourself at the gas station again–oh joy! While there are no set rules for you to follow here, I do have some suggestions for you. 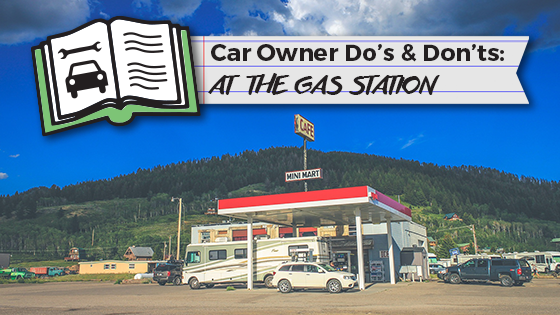 From making sure you are using the best gasoline for your vehicle to following some unspoken etiquette, here are some gas station do’s and don’ts for you to consider! DO: Make sure you are using the correct gas for your car. Every time you’re at the pump, you’re faced with different fuel options. These are octane ratings. While you should know the difference between regular and diesel gasoline, most don’t actually understand the difference between the other choices. Educate yourself! Take a look at your vehicle’s owner manual and see what type of gasoline it says is required or recommended for your car–and listen to it. Using the proper fuel for your vehicle will make a difference in the long run! Did this raise more fuel questions for you? Read more about this topic here. DON’T: Have bad manners. Everyone wants to get in and out of the gas station in a timely fashion, so help move this process along by staying polite! Know the bearings of your vehicle and align your car at the pump, leaving enough room for the other cars around you to still have ample space to maneuver their own vehicle. If the gas station happens to be crowded, find the pump that your car would fit best at, and politely wait for your turn behind the car that’s currently there. If you see an open pump in this crowded situation, if there doesn’t appear to be anyone obviously waiting for the pump, then it should be fair game! I know you hate it when someone swoops in and steals that parking spot from you, so don’t be that person to someone else! DO: Turn your car off while fueling! For your safety and those around you, remember to turn your car off before you start to pump gas into it. While many have their own opinions as to if this is actually dangerous, just do us all a favor and turn it off. The risk of explosions from the combination of your running vehicle and fuel being pumped are low, but there are still risks. DON’T: Smoke! This falls into the safety and gas station etiquette category. It should be common sense to not bring flames to an extremely flammable place, but I’m here to give you this simple reminder! 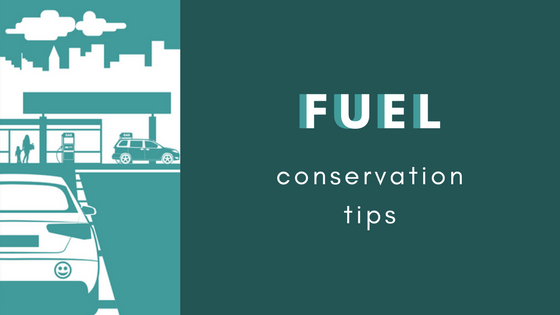 Don’t use lighters, matches, cigarettes, or anything of the sort while at the gas station, and all those around you will thank you! 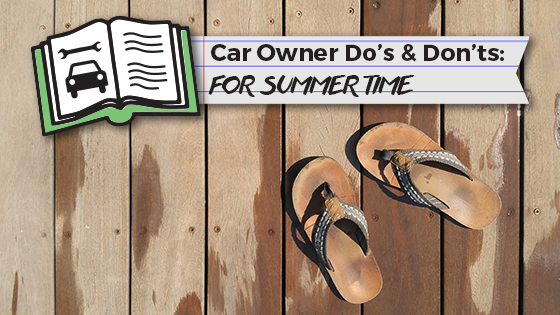 Car Owner Do's & Don'ts: For Summertime! As we head into the hot summer season, it is important that we take special care of our vehicles. Of course your car needs to be taken care of year-round, but during winter and summer it requires special attention and care due to the extreme weather conditions these seasons tend to bring. Here are a few do’s and don’ts of taking care of your car during the summertime: Check Your Tires DON’T: Take a road trip without checking to see if your tire tread will last the trip. The last thing you want to happen is one or more of your tires blowing out, leaving you and your friends stranded on the side of the road. DO: Check your tire tread by sticking a penny in the tread gaps with Lincoln’s head facing down. If you can see his entire head, it is time to get new tires. This simple trick can save you from experiencing a tire blowout. It is also important to make sure that your tires are properly inflated, especially if you are going on a road trip. Not only will properly inflated tires help prevent the risk of experiencing a blowout, they can increase your car’s fuel efficiency by up to 3%. Replace the Air Filter DON’T: Plan a summer full of hard driving and road trips without at least getting your air filter checked. Aside from the fact that your car’s air filter gets clogged with salt and other thick debris during the winter season, a clogged air filter will lower your fuel efficiency. DO: Take your car to get the air filter checked and/or replaced BEFORE your first road trip. This will better prepare your car for the trip and increase your gas mileage. Check the Coolant and Watch for Overheating DON’T: Just assume your car can withstand the summer heat without checking under the hood to see if its coolant levels are okay. Without a proper working cooling system, your vehicle will most likely overheat, since your engine temperature is increasing under low coolant levels. A recipe for disaster. DO: Take your vehicle to the service station and get the coolant topped off. During the summer, you’d want to your coolant to be a 50/50 mixture of antifreeze and water. Do you need to get your car summer ready? Stop by one of the McCarthy Auto Group service centers! Schedule your next service appointment here. One of the greatest things about having a car is being able to go on fun road trips with your friends. There’s nothing like venturing down the open road and seeing everything the world has to offer right from the seat in your car. 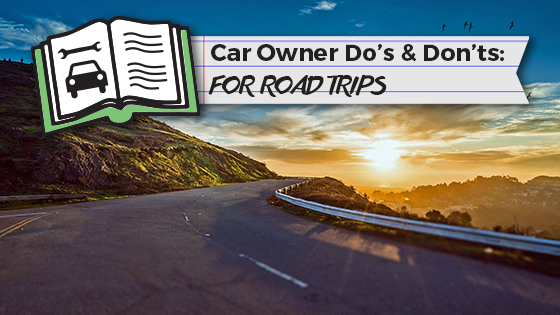 Before you head out on a road trip, I suggest you take a look at some important do’s and don’ts. DON’T: Head out on a road trip without precisely planning out the stops and towns you plan to visit. It is especially important to map everything out if you’ve never driven through the area. DO: Let family and friends that will not accompany you on the trip know where you will be going, and when you expect to be there. DON’T: Go on a trip without making sure your emergency items are packed and ready to use, should you need them. DO: Make sure to pack an emergency kit full of things such as medical supplies, car maintenance tools, a flashlight, portable phone charger, and map. DON’T: Be afraid to try and experience new things. DO: Make the most out of your trip! Make your road trip even greater by making a game out of it, such as being the person who tried the most unusual foods during the trip. Silly games like this not only make the trip fun, it helps to make more memories. DON’T: Hesitate to alert someone when there is a problem, even if you may have what you need in your emergency kit. Do not expect to be able to handle everything on your own. If you have all of the tools necessary to change a flat tire but find it to be more challenging of a task than you assumed, do not hesitate to call for help. DO: Stay calm and know that emergencies and accidents happen. Fortunately for you, you will have an emergency kit that should have what is necessary to get you the help you need. Buying a car, new or used, can be a super exciting time, but also just as stressful. If you are a first time car buyer, there are so many questions you may have, and things you may not know. 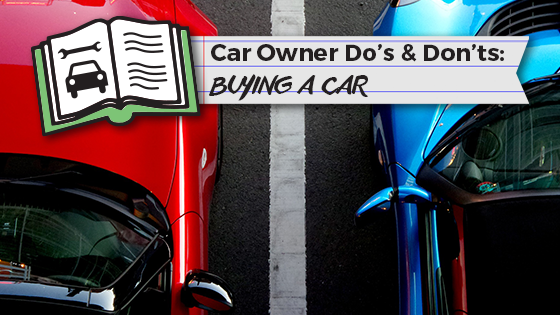 Believe it or not, there are do’s and don’ts when it comes to buying a car. 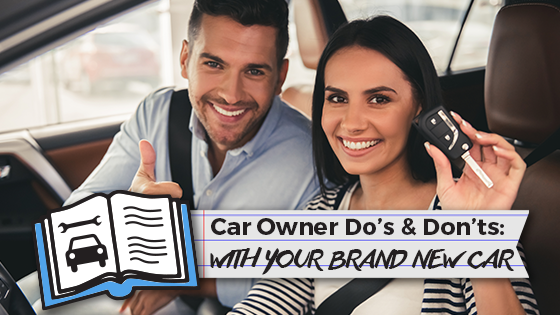 Here are some do’s and don’ts that will help you during the process of your next car purchase: DO: Research cars before you even visit a dealership. Take a look at your finances and figure out what you can afford. DON’T: Try to buy a luxury vehicle if you cannot afford it! DO: Test drive a vehicle before you purchase it. DON’T: Be suckered or pressured into purchasing a car if you do not feel 100% about it. It’s okay to wait especially when it comes to making a big purchase like this. Being able to test drive the vehicle you’ve been eyeing is a great way to see if it is really the right one for you. DO: Calculate if you’re financing to make sure that the terms match the amount you’ve agreed to finance. DON’T: Purchase unnecessary extras (such as fabric protection and paint sealant), especially if you are on a strict budget. These services are usually still available to you later on. DO: Research dealerships before you go. Find a place that has great reviews and a good reputation so that you know when you visit it will be a smooth process. DON’T: Buy from questionable used car lots and/or buy a car that you see for sale on the side of the road. DO: Check the CarFax of each vehicle you are considering purchasing. DON’T: Just assume that you are getting every detail from a salesperson. You want to make sure you can ask him or her questions about the vehicle you are interested in, especially if it had a previous owner. Are you looking to buy a new car? One of the McCarthy Auto Group dealerships has what you need! Visit the website here. Car Owner Do’s & Don’ts: With Your Brand New Car! You just drove home in a brand new car! Congratulations! Whether it’s pre-owned or you’re the first one to drive it, it’s still new to you, and that is something to celebrate! Maybe you’re in that honeymoon phase with your new ride, or maybe you’re overcome with nerves that you might wreck it. Whatever your feelings are towards this ride, there are some simple do’s and don’ts you can follow to help with your new vehicle! DO: Familiarize yourself with your new car! Whether you’re driving a different model than you used to, or just an updated version of your last car, you have some learning to do. Getting used to where the controls are, how the steering wheel feels, and how the brakes react can take some time, but stay observant and it will start to feel normal! DON’T: Forget about maintenance. When you get a brand new car, it’s easy to think that it’s already in perfect shape. Hopefully, it is! But, go ahead and take note of the tire’s tread, air pressure, fuel levels, etc. Just like when you’re renting a new apartment, do a walk around to make note of how the condition is when you get it. Make a mental note to do monthly maintenance checks of your car, and that will help prolong that new car feeling! DO: Make adjustments to your liking. You paid for this new car, so you deserve for it to fit you just right! I’ve encountered so many people who have driven their car for years being annoyed at the height of their steering wheel or other pesky details. These features should all be adjustable! Don’t think that you have to keep it the way it is, take some time to figure out how to adjust your vehicle’s features to maximize your comfort. DON’T: Let that new car smell fade away! It seems like once this smell fades away, that new car owner excitement does too. So, I have some tips to help you prolong this feeling! This smell that is loved by so many can actually come from the chemicals used to keep your seats and floors soft. Keeping your car well maintained and cleaned is the first step you can take to keep that new car smell going. Also, heat can dry out those chemicals pretty quickly, so beware of the sun! Park in the shade, crack your windows, and use sun shades on your windshield! Not only will these habits help keep the inside of your new car smelling fresh, but it will help prolong the life of your car’s exterior, too! 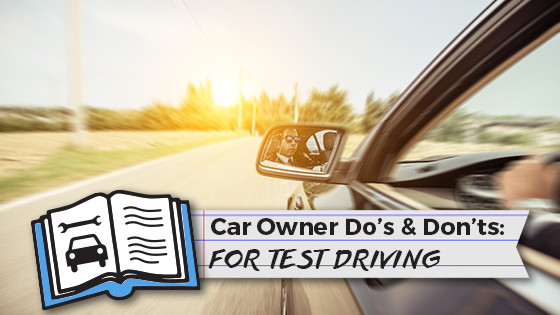 Car Owner Do’s & Don’ts: For Test Driving! Imagine going wedding dress shopping and never actually trying on the dress before you buy it. That doesn’t make a lot of sense, does it? You’d be taking a gamble with your hard earned money before you even knew if the dress was the right fit! This same rationale rolls over onto car-buying. Don’t buy a car until you know that it’s the perfect fit for you! This is where test driving comes in. Now that you understand the importance of a test drive, here are some simple tips to help you out! DO: Come prepared! Show up to the dealership knowing what models you’re interested in and what exactly it is that you’re looking for. Do some homework on the cars you want to drive first. That way, your test drive can just confirm or deny your interest! DON’T: Get distracted. Go into your test drive with a goal, and complete it. Try to eliminate as many distractions as possible. For you, maybe this means driving alone without your entire family chattering in the back seat. Or, maybe bringing a confidant with you to help observe your test drive can help you to stay on track! Stay focused so you can get the most out of your drive! DO: Inspect the interior AND exterior of the vehicle. More often than not, shoppers get so excited to finally get behind the wheel that they completely bypass inspecting the exterior of the car. Once you’ve inspected the outside, be sure to stay observant of the inside. Make a list ahead of time of what is most important to you, and be sure to take note of it on your drive! Maybe you care about having tons of headroom, or maybe the size of the cupholders is important to you–whatever it is, be sure to inspect it and stay observant throughout your test drive! DON’T: Rush your test drive. Maybe you talk fast when you get nervous, or perhaps the salesperson is on a tighter timetable than you. This is your hard-earned money you’re gearing up to spend, so take your time! From testing out varying speeds to driving on different terrains, take your time during the drive, and take time to reflect on it. These do’s and don’ts seem simple, but they are imperative to getting the most out of your test drive! I hope these little tips and tricks help increase your confidence in your car-buying process. You’ve been driving around that car of yours for years now, and you think it’s time for a new one. You have a couple options of how you can get rid of your old ride. Nowadays, dealers have put so much effort into making the trade-in process as easy and quick as possible. Don’t be intimidated by this process! Your car has trade-in value no matter what year, make, model, mileage or history it has seen–trust me! 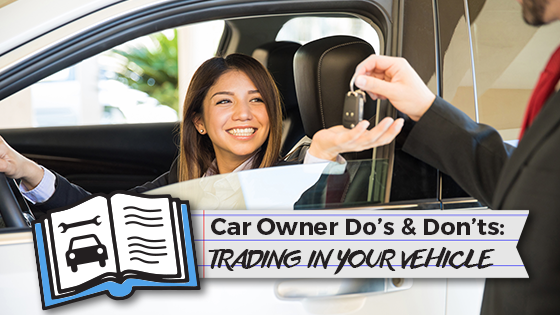 I’m here to share with you some do’s and don’ts when gearing up to trade in your vehicle. Out with the old, and in with the new! DO: Your research! This is the first and easiest step you can take, and you can complete it by simply sitting on your couch–so why not?! Figure out how much your car is worth. There are plenty of online tools that can help you estimate your vehicle’s value. Click here to try one out! DON’T: Just walk into this process blindly, doing research beforehand is key. Dealers are your friends, they are there to help you, but make sure you know what you’re talking about! Once you decide where you’d like to trade in your vehicle, go online to the dealer’s website and check out their trade-in tools and deals they are currently offering! I guarantee you almost every dealer out there has some sort of online information to help you begin your trade-in process. See for yourself–check out McCarthy Auto Group’s free online trade-in appraisal tool! DO: Clean your car. You want to get the most out of your trade-in, so have your ride looking its best! Get the exterior a good wash and wax. For the interior, remove all of your personal items and vacuum out the whole thing. DON’T: Feel like you have to make your old car look shiny and new. If you want to get it detailed, go right ahead! Dealers always say they can “see through the dirt,” so it isn’t imperative that your car is squeaky clean, but it doesn’t hurt to make a good impression! DO: Fix small issues on your car yourself (or hire someone to do so). Check all of your car’s lights inside and out, and replace any that might be out. And, top off the fluid levels. These are simple steps you can take to add to that good impression you’re going for! DON’T: Fix major issues. If there’s damage, what’s done is done. You can’t hide it, so leave that for the dealer to fix! You don’t want to spend a fortune having your car repaired, and the dealer can fix it for much less than what it would cost you. If there are more serious issues with your car, it lowers your vehicle’s value anyway, so leave that to be someone else’s problem.